Remote sensing makes it possible to collect data on a subject without any physical contact. During the past thirty years, rapid technological growth has advanced the ability of satellites to observe and monitor the global ocean. Today, it is possible to obtain and analyze large satellite data sets such of carious oceanic phenomena. Development of new marine environmental monitoring tools by remote sensing is one of the prioritized activities of CEARAC. Working Group 4 (WG4) has been working on the development of special monitoring tools for marine and coastal environment utilizing RS (Remote Sensing) technique. WG4 summarized the status of ocean remote sensing (RS) for the NOWPAP member states and published the National Reports and the Integrated Report on Ocean Remote Sensing for the NOWPAP region. WG4 updated the Integrated Report (2005) by adding latest information on ocean RS in the member states. The guidelines were made aiming at coastal managers in local government and professional researchers, for translating satellite remote sensing into information and tools that are useful for monitoring of eutrophication, which represents one of the most severe and widespread environmental problem in the NOWPAP region. 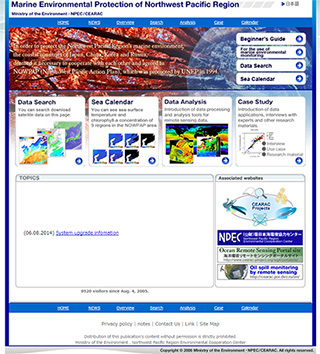 This website provides annotated satellite images over the Northwest Pacific region, which show detailed descriptions of various phenomena on the change of marine environment observed from space. 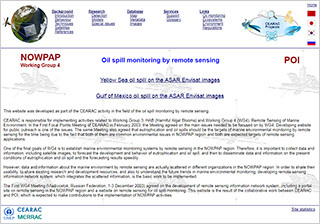 This website was developed in the field of the oil spill monitoring by remote sensing. 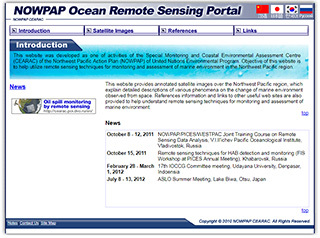 Ministry of Environment, Japan and the Northwest Pacific Region Environmental Cooperation Center (NPEC) operate “Marine Environmental Watch Project” to provide marine environmental data monitored by satellite. CEARAC organized NOWPAP Training Course on RS Data Analysis from 2007 to 2013 for students, young researchers and coastal managers to obtain useful skills and knowledge to utilize RS data in monitoring and assessment of the marine and coastal environment. In recent years, CEARAC has expanded its foci to seagrass meadows, one of essential habitats in coastal species. Using remote sensing monitoring techniques, CEARAC started monitoring of seagrass distribution in the NOWPAP region. CEARAC developed a manual for monitoring of seagrass and seaweed beds distribution with satellite images supported by Dr. Teruhisa KOMATSU. CEARAC implemented case studies of seagrass mapping in the selected sea areas in the member states with the manual for seagrass and seaweed beds distribution mapping with satellite images. After application of the developed manual for seagrass mapping with satellite images to some selected sea areas in the NOWPAP region, CEARAC investigated feasibility of assessing seagrass distribution in the entire NOWPAP region by collecting information and conducting literature review in each member state. The first International Workshop on Assessment of Seagrass Distribution in the NOWPAP region was organized in Himi City, in Toyama, Japan. Researchers on seagrass distribution mapping and a representative of UNEP participated in the workshop. The participants introduced on-going initiatives and/or studies on seagrass as well as national reports on literature review of the NOWPAP member states.